Public Relations always lands high on the list of needs for many artists. Publicity is a realm that helps amplify a creator’s voice and increase awareness about his or her art through a strategic set of skills. It’s highly integral to find a music publicist who understands your genre, is within your price range and is someone you trust. For an upcoming album release, prior to hiring a publicist, map out key dates and begin thinking of different promotional content. It’s important to come prepared with an idea of your timeline and strategy so you can decide which publicist’s availability and style complements your vision. Before you partner with someone, always think about your goals as an artist. Stem is focused on making sure artists are empowered with the knowledge needed in order to make crucial decisions about their music and their career. For this post, we synced with Lauren Camp of On Record PR, to get her expertise on everything related to the world of publicity. Read on for her 5 tips for how artists can get the most out of working with a publicist. The average person envisions PR as visibility in Rolling Stone, The Fader, Pitchfork and Stereogum but it’s so much more than that. Indie music PR revolves around an entire complex ecosystem of blogs (both big and small), podcasts, radio, regional and international publications, Soundcloud,Spotify & YouTube playlists, social media and websites. There are thousands of music blogs online, with thousands more popping up every year, and you have access to them all right at the tips of your fingers. Artists can easily do their own research to build a network of writers and bloggers, as they often list their contact information on the site. All you need is the time, internet, and knowledge to write a grammatically correct email with links to preview your music, a brief bio and links to your socials! Music publicity, similar to building a fan base or getting on playlists, takes time, dedication and effort. How great the music is or even how much your publicist loves you and your music doesn’t ultimately matter. It takes time to properly setup PR for a release, from developing the narrative, organizing assets and, of course, pitching the release for coverage. Music blogs of all sizes need time to prep a feature – it takes time to write a genuine review or article unless they’re copying our press release verbatim. You don’t want all of your press to be cookie cutter nor do you want to push your publicist to have to ask for favors every time you release something. When you are in the throes of a PR campaign, the effort sometimes feels lesser in comparison to the result if you solely gauge the result on how many placements you receive. Remember, quality over quantity. However, with a bit of foresight, organization, and grit, you can get good results. Note, every publicist is different but for an idea, On Record typically asks for at least three weeks ahead of a single or music video release and at least one month ahead of a project. PR services are an investment and can be expensive depending upon which route you go – indie boutique firm or larger agency – so do your research before committing yourself to the first company with which you meet. Having an idea of your budget before you talk to a publicist can save both of you a lot of time. Some will be totally out of your price range, others may negotiate and some will be a perfect fit. You should always approach a publicist with at least having an idea of when and how you want to put out your music. A plan like this allows your publicist to have conversations with editors about larger features. While you also want to keep fans happy and well fed with consistent content and releases, make sure your release rollout makes sense and you’re not rushing or putting out too much. If you don’t have a set release plan in place, even soft release dates with a flexible timeline are helpful. This way your publicist can provide you with a full strategy of how they are going to build your press presence and exposure throughout a full campaign of releases. Having a thought out release plan can also help you fully align your team and together you can be more strategic and creative. Hiring a publicist is only one part of the equation. Whether you’re doing it yourself or working with a full team, you need to make sure that you’re not solely relying on PR to launch your career and bring you overnight success. It’s important that you have a plan for approaching DSPs for playlisting support, running online marketing, putting together a strong social plan and booking local performances. Of course, it takes time to build the right team so make sure you’re bringing the right people into your circle who are dedicated to you and believe in your vision! Of course, a publicist will help you with this and there are brand developers and consultants out there to do it for you. Before you go down that road, take some time to reflect upon your music and your overall narrative. What makes you and your music stand out from the crowd? What is the story you are trying to tell with your upcoming release or the message you want to get out to your fans? An understanding of your brand helps you to shop for the right publicist and in turn, it helps your publicist understand your vision. Music publicity is a highly sought out facet of any release strategy and overall artist growth. 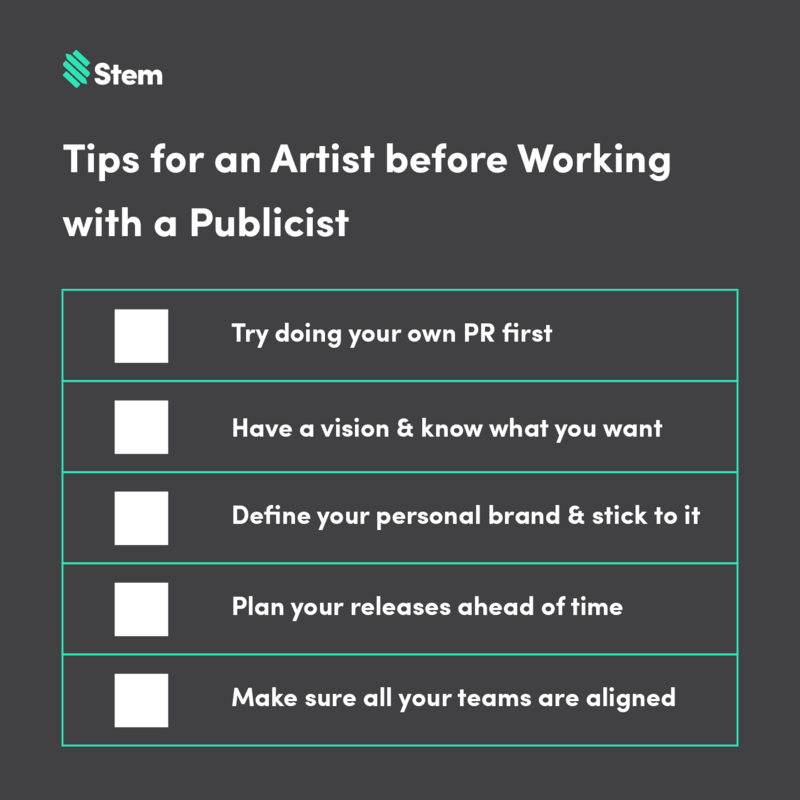 Because a publicist is a strong addition to an artist’s team, it is important to have an idea of desired qualities in this partner prior to setting out on the search. Make sure that whoever you bring on board understands and believes in your vision. Be ready to provide an outline of your release plan and act as a liaison between all members of your team to stay aligned and get the creative juices flowing. For more insight on album promotion and music distribution, checkout the Stem blog.